We’re almost finished with a round of editing for Tragic Wonders. In prior posts, you’ve seen some of the stories and essays that we dropped from TW because of thematic duplication. We’ve also separated out two poems that now provide a transition from the stories to the essays. The next step is copy editing. Seems the company is geared towards Microsoft Office production but, for the money, they’ll accommodate Amazon Kindle requirements. Whew! Actually, they’ve been encouraging, cooperative, and fast. We’ll see how much we can say about them at a later date. At this point, we plan to get TW out before Christmas (Thanksgiving is the real goal, but…). To do that, I want to have at least two professional reviews in place before issuing the press release and posting the Kindle book to Amazon and registering with the LOC and Red City Reviews usually posts to Goodreads but Goodreads requires an ASIN, Amazon’s ISBN equivalent… You get the idea, the timing will be tricky. Also, we were planning on switching from PRWeb to PR Newswire. You know, the PR firm recently hacked for customer data. We’ve had several favorable reviews on TW’s all important cover. Yes, it turns out we do judge a book by its cover (among other things, like favorable excerpts from perhaps unfavorable professional reviews). Right now, we have Tiānmìng – Mandate of Heaven priced at 99 cents. We’re going to raise the price back to $2.99 when TW comes out at 99 cents. In other news, we’ve decided to postpone publication of A Digital Carol until next Christmas. Actually, we’ll get it out before Thanksgiving 2014 to pick up on the buying season. We’ve already got the cover concept roughed in. Yup, we’ll get this marketing thing down, yet. Hopefully, before we’re out of funds. We plan to start Who Shall be God early in 2014 while ADC is in editing (yes, book three, that became book four, is book three again). The WSBG themes are coming together. It turns out that the 38th parallel not only runs through the Korean DMZ but through Virginia and Maryland. Hmm, I wonder if that’s significant given what DC has been doing lately? Book five is about China. We’re still waiting for Xi and company to declare their intent after the Third Plenum meeting of the Communist Party’s Central Committee. Other news of interest is that China has twice the shale gas reserves as the US does. That should swing the balance all other things being equal. We’ll see. And finally, we’ve updated our links page. In the not too distant future, the world is falling apart at the seams, which is depicted in the political thriller, ‘Tiānmìng – Mandate of Heaven’ by Adolphus Writer and Nomi T. Smith. This fast paced novel tells the story of Michael Babbage, a freelance reporter who is hired to document and analyze what is happening to the civilization of man. Between the political conflicts that have arisen and the natural disasters that are destroying the balance of society, there is not much to hope for besides an alternative to the failing situation at hand. The United States is a nation at unrest, but due to the strong will of President Moses Orestes, he refuses to let his people give up on the nation that he cares about so dearly. When Yellowstone erupts, half of the United States population has to move to Canada, while elsewhere in the world weak governments are taking advantage of the fact that other formerly powerful states are falling apart. Nuclear explosions are also reshaping the Asian continent, as Michael strives on to find answers on how to stop the ongoing calamity from continuing. To purchase a copy of Tiānmìng – Mandate of Heaven, click here to find it on Amazon. A status update from Adolphus Writer – Ms Smith finished the first draft of Tiānmìng, Mandate of Heaven, a memoir of our once and future Republic. We are on track for a late spring or early summer publication. 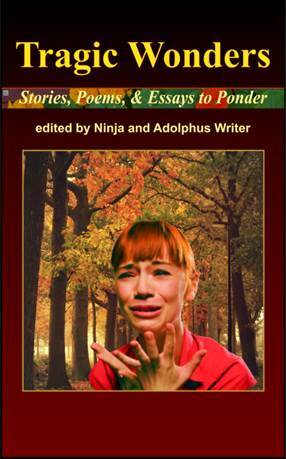 The novella chronicles the rise of the United States after befalling a “natural” cataclysm. Ms. Smith takes a tough look at us as Americans and us as citizens of the world. She asks us to look at ourselves through the lens of the story and ponder what we would do in these circumstances. Through it, we are asked to consider what we are doing right now and whether it makes a difference for good. I urge you to take her message to heart, especially during this crucial election season. The liberty and wellbeing of our posterity is at stake. NaNoWriMo was harder than I expected. My author, Nomi Tareen Smith, has 22,000 words of a historical fiction novel framed as a ‘memoir of the Republic’ set in the near future. 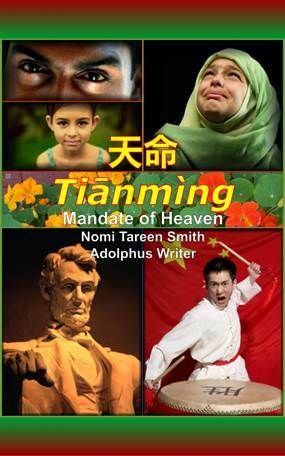 The title is Tiānmìng, Mandate of Heaven. It chronicles the fall and rise of the United States of America. The novel structure is conventional but the presentation consists of materials from fictional transcripts, interviews and personal recollections of the participants with lead ins by Ms. Smith. The novel’s major sections are Portents, Run Up for Protection, Run Up for Conquest, Crisis, War and Aftermath. The general synopsis is: Subordinates play roles on the world stage leading to a new order not yet revealed to them or us. These have to grapple with what obligations they have to themselves, to others (past, present and future) and to Heaven. Some will succeed and some will fail. The outcome is left to the reader to decide. Ms. Smith will finish the novel by early January (we hope). My editorial staff will review and revise the novel with Ms. Smith’s consultation and consent. Then, we will publish to Amazon and Barnes and Noble directly using their tools. The avatar for this blog is a symbol formed from a stylized chinese character for ‘order’ (i.e., mìng) superimposed on a water background. The character, mìng, when affixed to another character, Tiān, (translated as heaven) represents the concept for ‘mandate of heaven‘. The water background symbolizes the people of the earth, past, present and future. Our intent, upon which we may sorely fail, is to influence people’s perception of heaven’s mandate, not just for our rulers (but certainly that), but also for ourselves. This blog serves as a creative outlet for musings that may find their way into press. If these musings are interesting to you, please stop back periodically.